For the most demanding polishing jobs. Harsh scratches and paint defects are always a challenge to remove. Now you can remove sanding scratches starting from P1200 efficiently with the Tander Cutting Compound. This compound is capable of tackling the harshest challenges to make sure you can quickly finish your job. Save time and money using the fastest solution for aggressive polishing. that's why professionals choose the Tander Cutting Compound. Clean the surface before polishing. Shake well before use. Apply a sufficient amount of compound on a hard polishing pad and distribute evenly. Polish with medium pressure on the machine (medium-high speed, 1300-1500 RPM). Reduce pressure when the polishing material starts to dry, until all scratches are gone. Finish the surface with a microfibre cloth. For an improved finish, follow up with Tander One Step Polish. Recommended for use with a hard polishing pad and rotary machine directly after sanding with P1200 or P1500 for the best results. For the best results, use in combination with the Tander Foam Pad Hard. Complete your job with the Tander One Step Polish for the ultimate high-gloss result. How do I dose the Tander Cutting Compound properly? The bottle of the Tander Cutting Compound is supplied with a push/pull cap. Due to this cap you can only dose a small amount each time so you won’t overdose easily. 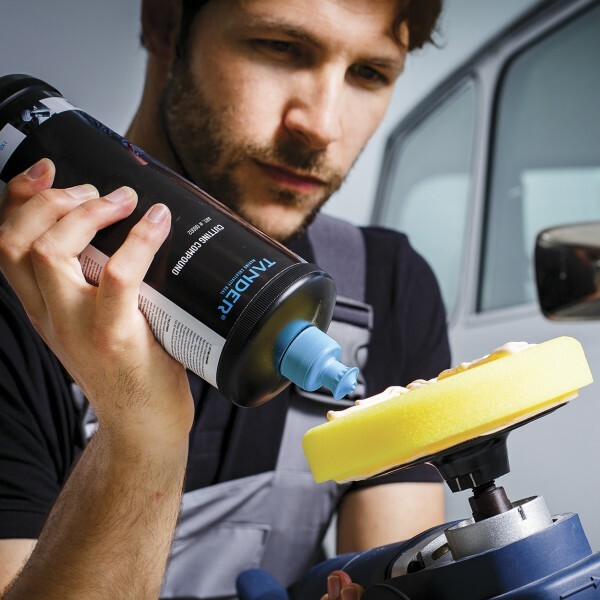 Easily pick the right dose for your task while applying the polishing compound directly on to your Foam Pad. No, Tander Cutting Compound is solvent-free and silicone-free. This means the compound is safe for rubber and plastic parts. Which Foam Pad should I use in combination with the Cutting Compound? For the best results, we advise to use the Tander Cutting Compound in combination with the Tander Foam Pad Hard.